Swedish Meatballs, a favorite at our house. 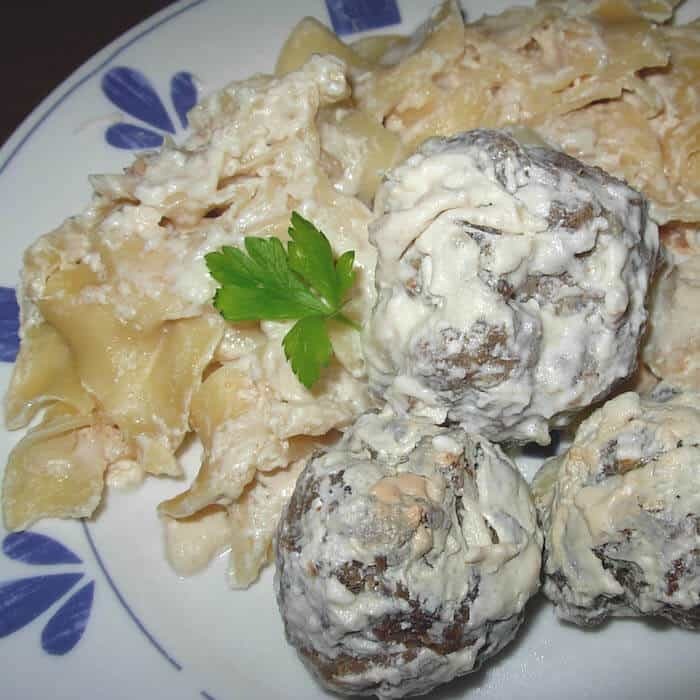 Meatballs, cream sauce, noodles. The best comfort food. This Swedish Meatballs Recipe is super easy. 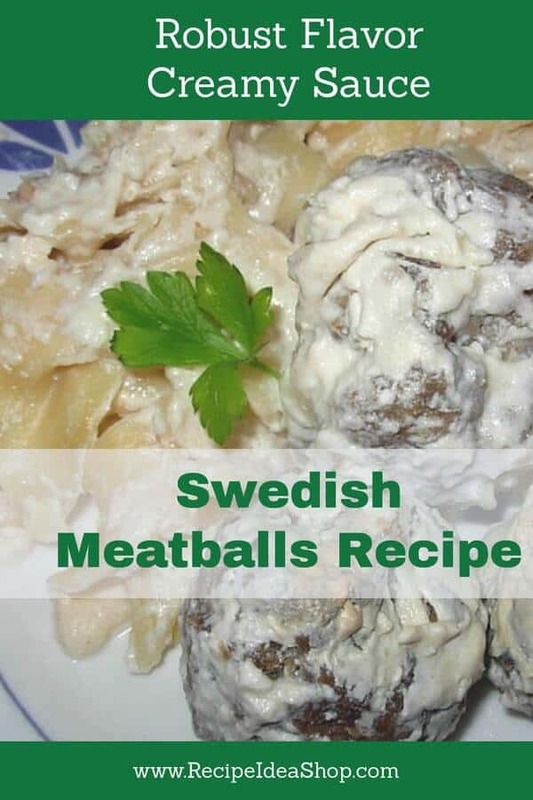 Swedish Meatballs is one of my children’s favorite meals. My daughter Erin asks for this meal whenever she comes to visit. I usually make double the meatballs and freeze half for the next time. Since Erin’s wife Julie is vegetarian, I make a separate pan of these that are vegetarian. Check out Vegetarian Swedish Meatballs. 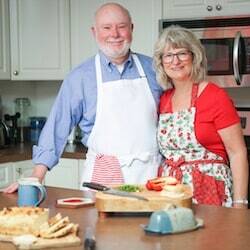 The original recipe came from one of my all-time favorite cookbooks, Betty Crocker’s International Cookbook. If you don’t have this cookbook, I recommend you buy one. Every recipe I have made from it is totally awesome. Betty Crocker’s International Cookbook. Buy it on Amazon. Meatballs made with two meats, covered in sauce on top of noodles. Comfort food! Mix to thoroughly combine: beef, pork, bread crumbs, milk, egg, onion, salt, nutmeg and pepper. Shape mixture into 2-inch balls. Cook uncovered in 350F degree oven until lightly browned, about 20 minutes. Melt butter in a saucepan, stir in flour. Slowly add the half and half and water. Place the meatballs in a glass casserole dish, cover with the sauce, sprinkle with snipped parsley and heat for a few minutes (3 minutes or so) in the microwave (or oven). Serve over cooked wide egg noodles with a green vegetable on the side. You’ll need a casserole dish for this recipe. How about this one, it’s one of my favs. Le Creuset Heritage Stoneware 12-by-9-Inch Covered Rectangular Dish, Cerise (Cherry Red). Buy it on Amazon. 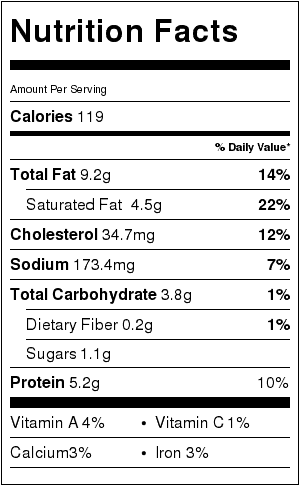 Swedish Meatballs Recipe Nutrition Label. Each serving is about 4 meatballs, 1/3 cup sauce and 1 cup noodles. 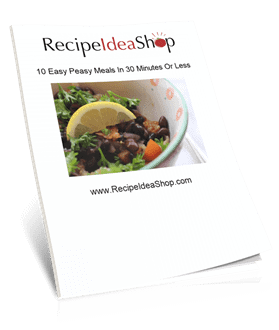 Swedish Meatballs Recipe Nutrition Label (NO NOODLES). Each serving is about 4 meatballs and 1/3 cup sauce. I really love Swedish meatballs, if I cut every ingredient into half, let’s say for 3-4 servings. Do you think it’s a good idea? And what milk do you prefer? Whole, half-half or fresh milk? Thanks! Yes, you can cut the recipe in half and it will turn out fine. I use half and half in the sauce because it tastes richer to me. But remember, you can freeze the meatballs after you cook them (or even before), so I suggest you make extras and do that. It’s a very quick and delicious supper, and all you have to do it make the sauce and noodles and heat everything in the microwave.